Low back pain has obvious lifestyle and financial burdens; when it is accompanied by radiation of pain and numbness in the lower extremities, it can be truly debilitating. Lumbar disc herniations account for only 4 percent of low back pain patients, but account for a high percentage of low back pain costs. A painful disc herniation results when a tear of the annulus fibroses allows migration of the nucleus pulposus (protrusion), resulting in nerve root irritation. Lumbar disc herniations typically occur in individuals between the ages of 30-40 years,1-2 when the nucleus pulposus is still fluid and the annulus is weakened by strenuous activity and age. Due to this relatively young demographic, poor treatment outcomes can result in decades of suffering for these patients. In adult discs, blood vessels are normally restricted to supplying only the outer layers of the annulus. Low oxygen tension at the center of the disc leads to an anaerobic metabolism, resulting in high concentrations of lactic acid and low pH. These deficiencies in metabolite transport limit both the density and metabolic activity of disc cells.4 Collagen turnover time in articular cartilage is approximately 100 years5 and is theorized to be even longer in the disc.6The result is that intervertebral discs have a limited ability to recover from metabolic or mechanical injuries such as herniations. Inflammatory markers such as IL-1, IL-6 and TNF-a are also present at the site of disc herniations, leading to higher prostaglandin E2 concentrations. Two studies have demonstrated that laser therapy is effective in reducing prostaglandin E2 concentrations.10-11 Bjordal has demonstrated that inflammation is greatly reduced 75, 90, and 105 minutes after active laser therapy compared to levels prior to treatment.11 The reduction in inflammation appears to be another method by which laser therapy promotes healing in disc herniations. In the review of laser therapy for low back pain performed by the American Pain Society / American College of Physicians, four trials (566 patients) demonstrated that laser therapy was effective and one trial (140 patients) found laser therapy to be no more beneficial than a sham laser device. The conclusion from this review was: "Non-invasive therapies (low-level laser therapy) have not been shown to be effective for chronic, sub-acute or acute low back pain. "17 A letter to the authors regarding their bias against laser therapy and in support of pharmaceuticals19 only prompted the authors to downgrade the evidence supporting acetaminophen and cite the Cochrane study to support their stance on laser therapy. The Cochrane study they refer to found that "three high quality studies (168 people) separately showed statistically significant pain relief with laser therapy in the short-term (less than three months) and intermediate term (less than 6 months) when compared with sham laser therapy. "18 Two small trials (151 people), also included in the Cochrane review, independently found that the relapse rate in the laser therapy group was significantly lower than in the control group at six-month follow-up. The conclusion was that "based on these trials, with a varying population base, laser therapy dosages and comparison groups, there is insufficient data to either support or refute the effectiveness of laser therapy for low back pain." The financial justification for the use of laser therapy as the first line of defense in disc herniations is overwhelming. Data collected from the SPORT trial found that the average surgical procedure cost $15,139, which rises to $27,341 when other costs such as diagnostic tests and missed work are factored in.21 The cost of conservative treatment in that same study averaged $13,108. In our experience, even the most extreme example of a herniated disc patient (receiving 40 treatments), resulted in a total treatment cost of just $3,200. When diagnostic tests and health care visits are factored into this equation, the total cost of laser therapy is closer to $5,700. This is a savings of more than $20,000 versus surgery and $7,500 over standard conservative treatment. Moreover, laser therapy is noninvasive and no adverse events have been reported in more than 3,000 publications. In summary, this review of the current literature clearly reveals some of the shortcomings of meta-analyses and the performance of studies without standardized methodologies. We conclude that medical convention has demonstrated that the relief of symptomatic disc herniations continues to be problematic; and that both conservative and surgical solutions in the majority of cases appear to be equally ineffective. While the application of appropriate therapy requires a comprehensive understanding of the anatomy, pathology and biomechanics of the spinal column, we feel that laser therapy presents the most logical and effective therapeutic approach in managing these pervasive medical conditions. Adams MA, Hutton WC. Prolapsed intervertebral disc. A hyperflexion injury. 1981 Volvo Award in Basic Science. Spine, 1982;7:184-191. Gallagher S. Letter to the editor. Spine, 2002;27:1378-1379. Teplick JG, Haskin ME. 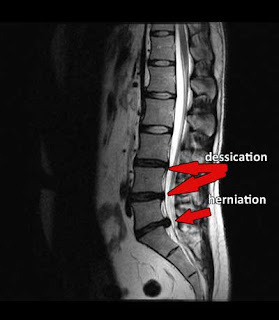 Spontaneous regression of herniated nucleus pulposus. Am J Roentgenol, 1985;145(2):371-5. Urban JP, Smith S, Fairbank JC. Nutrition of the intervertebral disc.Spine, 2004;29(23):2700-9. Verzijl N, DeGroot J, Thorpe SR, Bank RA, Shaw JN, Lyons TJ, Bijlsma JW, Lafeber FP, Baynes JW, TeKoppele JM. Effect of collagen turnover on the accumulation of advanced glycation end products. J Biol Chem, 2000;275(50):39027-31. Adams MA, Roughley PJ. What is intervertebral disc degeneration, and what causes it? Spine, 2006;31(18):2151-61. Doita M, Kanatani T, Harada T, Mizuno K. Immunohistologic study of the ruptured intervertebral disc of the lumbar spine. Spine, 1996;21(2):235-41. Groenblad M, Virri J, Tolonen J, Seitsalo S, Kaeaepae E, Kankare J, Myllynen P, Karaharju EO. A controlled immunohistochemical study of inflammatory cells in disc herniation tissue. Spine, 1994;19(24):2744-51. Young S, Bolton P, Dyson M, Harvey W, Diamantopoulos C.Macrophage responsiveness to light therapy. Lasers Surg Med, 1989;9(5):497-505. Lim W, Lee S, Kim I, Chung M, Kim M, Lim H, Park J, Kim O, Choi H. The anti-inflammatory mechanism of 635 nm light-emitting-diode irradiation compared with existing COX inhibitors. Lasers Surg Med, 2007;39(7):614-21. Bjordal JM, Lopes-Martins RA, Iversen VV. A randomised, placebo controlled trial of low level laser therapy for activated Achilles tendinitis with microdialysis measurement of peritendinous prostaglandin E2 concentrations. Br J Sports Med, 2006;40(1):76-80. Toya S, Motegi M, Inomata K, Ohshiro T, Maeda T. Report on a computer randomized double blind trial to determine the effectiveness of the effectiveness of the GaAlAs (830nm) diode laser for attenuation in selected pain groups. Laser Therapy, 1994;6:143-148. Soriano F, Rios R, Gallium Arsenide laser treatment of chronic low back pain: a prospective, randomized and double blind study. Laser Therapy, 1998;10:175-180. Basford JR, Sheffield CG, Harmsen WS. Laser therapy: a randomized, controlled trial of the effects of low-intensity Nd:YAG laser irradiation on musculoskeletal back pain. Arch Phys Med Rehabil, 1999;80(6):647-52. Gur A, Karakoc M, Cevik R, Nas K, Sarac AJ, Karakoc M. Efficacy of low power laser therapy and exercise on pain and functions in chronic low back pain. Lasers Surg Med, 2003;32(3):233-8. Djavid GE, Mehrdad R, Ghasemi M, Hasan-Zadeh H, Sotoodeh-Manesh A, Pouryaghoub G. In chronic low back pain, low level laser therapy combined with exercise is more beneficial than exercise alone in the long term: a randomised trial. Aust J Physiother, 2007;53(3):155-60. Chou R, Huffman LH. Nonpharmacologic therapies for acute and chronic low back pain: a review of the evidence for an American Pain Society/American College of Physicians clinical practice guideline.Ann Intern Med, 2007;147(7):492-504. Yousefi-Nooraie R, Schonstein E, Heidari K, Rashidian A, Pennick V, Akbari-Kamrani M, Irani S, Shakiba B, Mortaz Hejri SA, Mortaz Hejri SO, Jonaidi A. Low level laser therapy for nonspecific low-back pain.Cochrane Database Syst Rev, 2008: CD005107. Bjordal JM, Klovning A, Lopes-Martins RA, Roland PD, Joensen J, Slordal L. Overviews and systematic reviews on low back pain. Ann Intern Med, 2008;148(10):789-90. Unlu Z, Tasci S, Tarhan S, Pabuscu Y, Islak S. Comparison of 3 physical therapy modalities for acute pain in lumbar disc herniationmeasured by clinical evaluation and magnetic resonance imaging. J Manipulative Physiol Ther, 2008;31(3):191-8. Tosteson AN, Skinner JS, Tosteson TD, Lurie JD, Andersson GB, Berven S, Grove MR, Hanscom B, Blood EA, Weinstein JN. The cost effectiveness of surgical versus nonoperative treatment for lumbar disc herniation over two years: evidence from the Spine Patient Outcomes Research Trial (SPORT). Spine, 2008;33(19):2108-15. Kahn F. Low intensity laser therapy: The clinical approach. Proc of SPIE, 2006:6140, 61400F-1-61400F-11. Dr. Fred Kahn is a graduate of the University of Toronto, Faculty of Medicine, a fellow of the Royal College of Surgeons of Canada and the diplomate of the American Board of Surgery. He is the founder of Meditech International, Inc.
Dr. Michael Patterson received his undergraduate and master's degrees in medical biophysics from the University of Western Ontario. He is the research and education manager for Meditech. Cold laser therapy is used in our NYC Physical therapy practice along with other cutting edge techniques and devices. DRX 9000 non-surgical spinal decompression for herniated disc and sciatica, Graston technique for Soft tissue injuries.